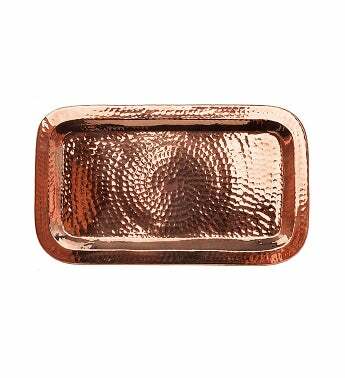 This tiny platter will shine in any situation. Perfect and multi-functional for everything from flight tastings with shot cups and bar set ups or use it for everything else when not entertaining as a vanity or valet tray, or an attractive catch-all tray for your keys or mail at your entrance. 12 inch x 7 inch rectangular tray. Heavy gauge, Pure copper from 100% recycled sources for a healthier environment. Copper is an inherently clean material with strong natural antimicrobial, antibacterial and anti-fungal properties.